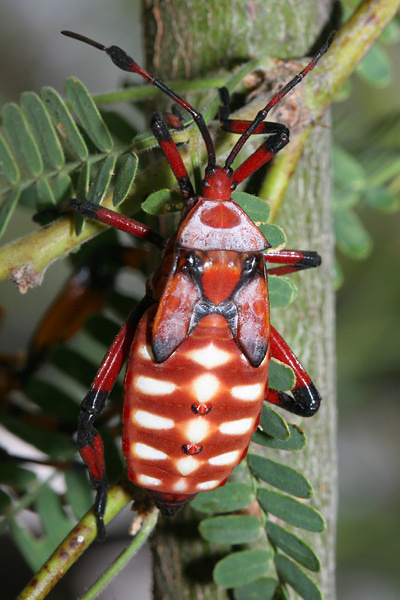 During early summer here in the Sonoran Desert, clusters of large, strange-looking, red and white bugs can be spotted on the foliage of mesquite trees (Prosopis spp.). These colorful bugs are the immature, wingless nymphs of the Giant Mesquite Bug or Leaf-footed Bug (Thasus neocalifornicus). 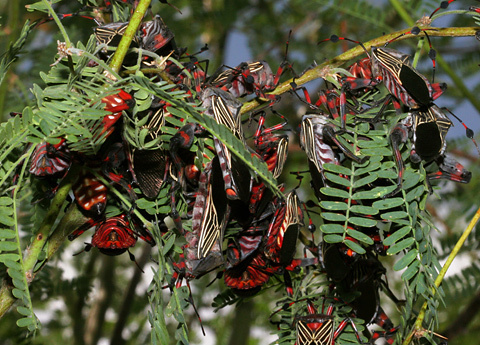 Giant Mesquite Bug nymphs are striped red and white and have plump, red and black legs, bluish wing-stubs, and large, red and black antennae with a flattened sensory disk below the terminal segment. 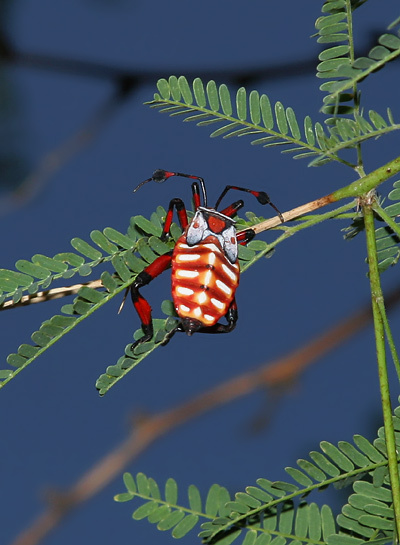 The bright, conspicuous colors of the Giant Mesquite Bug nymphs are a form of aposematic coloration meant to warn potential predators that they are not good to eat. If bothered, the flightless nymphs will produce a stinky secretion to repel predators not already warned off by their bright colors. I have never observed birds bothering Giant Mesquite Bug nymphs, and my dogs avoid any that fall on the ground. 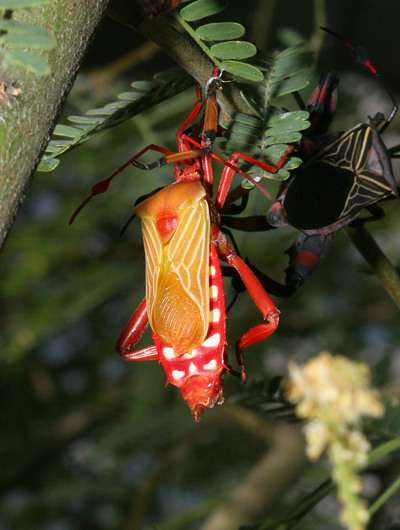 The much less colorful adult Giant Mesquite Bugs have wings and are capable of flight. 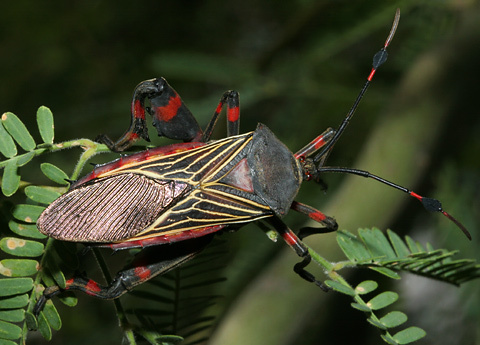 Adult Giant Mesquite Bugs are up to 1 1/4 inches (3.2 cm) long and have black wings with yellow veins and red and black-banded antennae and legs. The sexes can easily be distinguished because male Giant Mesquite Bugs like this one have greatly enlarged femurs on their hind legs. Giant Mesquite Bugs of several different developmental stages can sometimes be spotted all together on a mesquite branch. This strangely colored Giant Mesquite Bug below is in the process of growing out her wings, and she is either pale from recently molting or is some sort of color mutant. Since Giant Mesquite Bugs feed only on the sap, tender leaves, and green seed pods of mesquite trees, they are only found in areas with plenty of these trees. Giant Mesquite Bugs are especially common here in Tucson, Arizona because of our abundant Velvet Mesquites (Prosopis velutina). 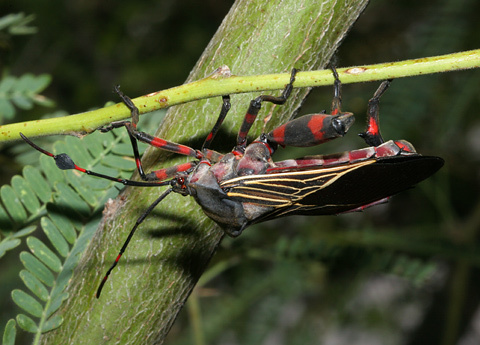 Similar, primarily Mexican species of Giant Mesquite Bug, T. acutangulus and T. gigas, also feed on mesquite trees. Fortunately, Giant Mesquite Bugs do not do any significant damage to mesquite trees and control for them is not necessary. The Velvet Mesquite tree above is in my backyard, and it was not harmed by the rather creepy-looking mass of feeding Giant Mesquite Bugs.